The Pickens County Sheriff’s Office led by Sheriff Rick Clark will be conducting a Church Safety Seminar on Tuesday, October 27, 2015 at 6:00pm at Rock Springs Baptist Church in Easley. The focus of the seminar which is expected to last approximately two hours is to assist places of worship in evaluating their current procedures and developing plans that will help to protect their congregation from acts of violence. Topics to be covered are “Safety Action Plans”, “Liability in Today’s World”, “Overall Security”, “Protection of Children”, “Active Shooter Response” and much more. The Pickens County Sheriff’s Office has sent out in excess of 250 invitations to local churches and their security teams that may be interested in this training. Any member of the public that would also like to attend is welcome. Rock Springs Baptist Church is located at 201 Rock Springs Rd in Easley, SC across from Wal-Mart on Highway 123. I personally want to thank the people of Pickens County for their outpouring of support for the water and animal food drive. We filled a 16’ trailer, a 10’ trailer and two truck beds full of supplies that was transported to the victims of the floods. The people of this county once again showed why this is the best place to live. Go South Carolina!!! The Pickens County Sheriff’s Office has located Billy Mack Richard (69yoa) who was previously reported missing to the Pickens County Sheriff’s Office by a family member. Mr. Richard was located earlier today at a restaurant in Pickens County and was interviewed about the circumstances of his disappearance which occurred on Friday, October 9, 2015. Detectives have determined that the incident does not involve any foul play and that Mr. Richard had left and not returned to the residence by his own decision. The Sheriff’s Office extends our appreciation to the media for assisting us with this investigation and also to the public for the information and leads that have been forwarded to our office in the search for Mr. Richard. Pickens County Sheriff’s Office (SC) shared Liberty Elementary School‘s photo. The Pickens County Sheriff’s Office is partnering with Liberty Elementary School to continue collecting dry pet food for animals in need, in the Columbia area! We are extending our collection time until 12 noon on Friday, October 16th. There is a drop-off zone in the lower parking lot of the Sheriff’s Office and in the lobby of the Liberty Elementary School. Thanks to all who have already donated, and to those of you plan to donate! Libby and Dollie Mae are asking for your help! They want to help their friends in the flooded areas of Columbia. Will you help? In 1983, the late Senator Strom Thurmond established the Strom Thurmond Awards for Excellence in Law Enforcement. These annual awards were to recognize one law enforcement officer from each level of government – city, county, state and federal. 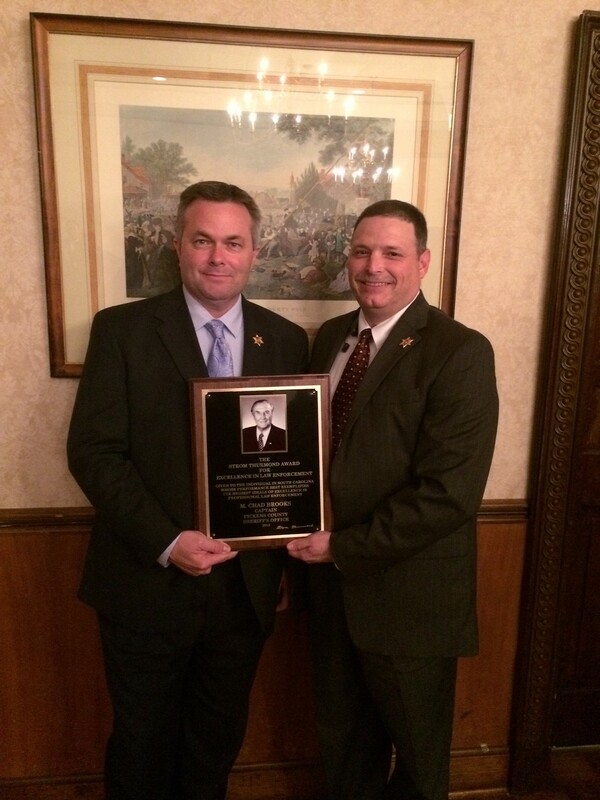 The Strom Thurmond Foundation has continued the tradition of presenting the awards during an awards ceremony hosted by the U.S. Attorney’s Law Enforcement Coordinating Committee and the South Carolina Law Enforcement Foundation. Captain Chad Brooks, a 26 year veteran of the Pickens County Sheriff’s Office, was selected and presented the 2015 award for the outstanding law enforcement officer at the county level on Friday, October 2, 2015 in Columbia, SC. Captain Brooks oversees the Detective Division and is one of only four Division Commanders at the Sheriff’s Office. The bulk of his career has been focused in the area of advanced investigations and more specifically in the field of narcotics. Captains Brooks was recognized for his level of professionalism, his high standards of excellence and the positive impact that he has had not only in the community that he serves but also to the men and women that he manages on a daily basis. Through the professional relationships that Captain Brooks has with other jurisdictions at all levels, Pickens County has on many occasions benefited from resources extended to Pickens County during high level investigations at no expense to the local tax payer. “Chad Brooks is an invaluable asset to the Sheriff’s Office and Pickens County is fortunate to have him not only at our agency but as a lifelong citizen of our community. His love for our county is seen every day in his commitment and dedication to improve the quality of life for our citizens. The manner in which Captain Brooks conducts his personal and professional life sets a standard by which we all can target as our personal goal for success”. 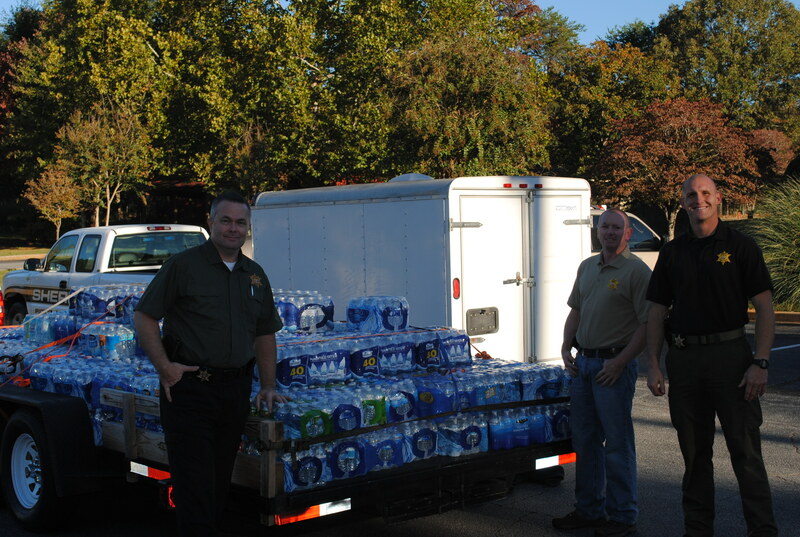 The Pickens County Sheriff’s Office is collecting donations consisting of bottled water and dry pet food for the citizens of South Carolina affected by the recent flooding. Bottled water is in high demand due to the damage and contamination to the supporting infrastructure for water and sewer systems in and around the flood zones. Families suffering from the devastation are struggling to provide not only for themselves but also for their pets with local animal shelters experiencing overwhelming demands for temporary care and support for cats and dogs. 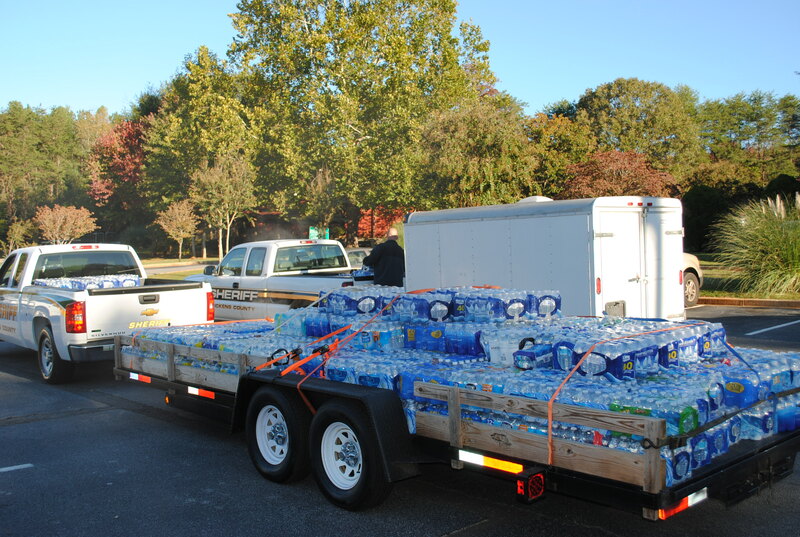 The Sheriff’s Office is asking anyone that would like to specifically donate bottled water and/or dry pet food to drop it off at the Pickens County Law Enforcement Center located at 216 C. David Stone Rd. in Pickens during normal business hours (8:30am until 4:30pm) from now through Friday afternoon. 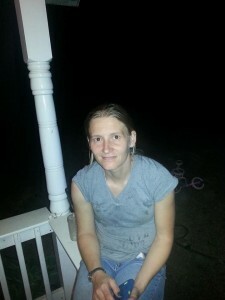 The Pickens County Sheriff’s Office was contacted early this morning about the disappearance of Melissa Sue Heaton (35yoa) last seen at her residence in the Dacusville Community at approximately 7:00am on Wednesday, September 30, 2015 by a family member. Ms. Heaton is described as a W/F, 5’3”, approximately 117lbs with blondish brown hair and brown eyes. She is believed to be driving a 2009 Chevrolet Cobalt (red in color) displaying SC license tag# 511-5GZ. The circumstances of Ms. Heaton’s disappearance are unknown at this early stage of the investigation; however, the Sheriff’s Office has not uncovered any evidence of foul play thus far. Anyone with information as to the whereabouts of Melissa Sue Heaton is asked to call the Pickens County Sheriff’s Office at (864) 898-5500. The investigation is currently being conducted by Detectives with the Sheriff’s Office. An image of Ms. Heaton has been attached to this release.